Also referred to as the WX3 Pro, the Tecno WX3 P is the ‘professional’ variant of the budget WX3 smartphone. So what’s the upgrade that makes it Pro? It looks like that is the twice powerful battery it carries under the hood. Tecno WX3 P looks much like the earlier WX3. You may not be able to turn many heads with this one, looking at the plastic body. It just gets the job done. This is a thick device at 9.4 millimetres. The display is similar to that of the Tecno WX3: a 5-inch unit having an FWVGA resolution of 854 x 480 pixels. The multi-touch screen uses IPS technology, which means views from the sides should be decent. It doesn’t look like anything has changed in the camera department for the Tecno WX3 P. And that may be considered disappointing for something that is dubbed ‘Pro.’ You still get the same 5 megapixel front and back camera combo. These are things of budget devices. If you thought you would be getting more storage space, think again. The Tecno WX3 P gives you 8 GB onboard storage. Thankfully, it allows you add up to 32 GB more using a microSD card. Under the hood is a quad-core MediaTek processor, obviously unchanged from the WX3. So, performance is not likely to witness any upgrade here since you still get the lowly 1 GB of RAM. 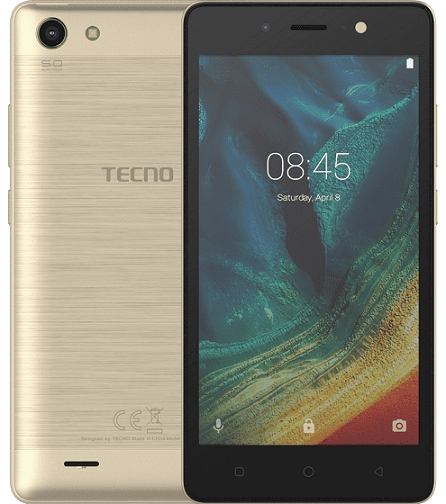 Tecno WX3 P features Android 7.0 Nougat operating system. One can easily see that the only thing Pro about the Tecno WX3 P is its humongous battery with a capacity of 5,000 mAh. That is twice the capacity of the juicer on the regular variant. This is said to last up to three days on a single charge. Yeah, that must be professional. Or isn’t it? Tecno, over to you. There is only 3G support, no 4G. The dual SIM smartphone offers standard connectivity options, including microUSB 2.0, Bluetooth 4.0 and Wi-Fi 802.11 b/g/n with hotspot. It may be argued the ‘Pro’ addition to the name of the device doesn’t appear to be justified. Tecno WX3 P is not yet available in Nigeria, Ghana, and Kenya. When available, you can buy the affordable smartphone at leading online stores in Nigeria and Kenya. Tecno WX3 P Price in Nigeria ranges from 26,500 Naira to 35,000 Naira depending on your location in the country. Price in Kenya starts at around KSh 7,499.